This beautiful design highlights a stunning Victorian style leaded window, surrounded by an old white wash wooden frame. 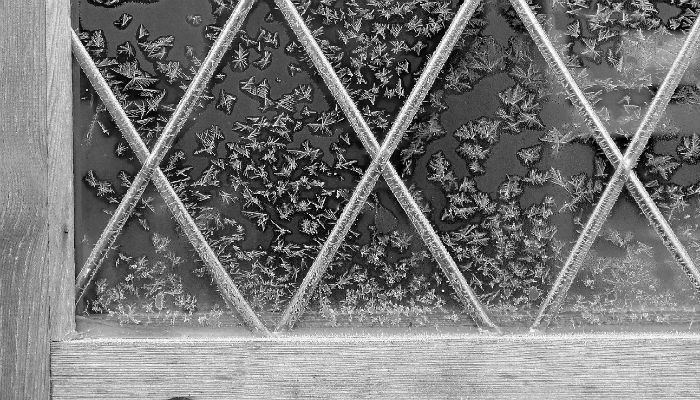 The window panes are covered with delicate snowflakes that have frozen to the glass, making the shape of tiny butterflies almost. To some of us in the eCO2 Greetings office this image reminds us of our childhood breathing onto frozen windows to witness the ice melt under warm breath, or etching our names into them to mark our territory. Your business Christmas ecards need to invoke that kind of emotion and this ecard doesn’t fail in that regard. The soft falling snow adds a real feel of Christmas holiday spirit. The ecard is very chic and vintage and give you the feel of this being a real timeless classic. The window may belong to a large stately home in the country or a large castle high on a mountain. The image allows the ecards receiver to decide for themselves and get lost in the story! At eC02 Greetings, we feel all our stunning corporate holiday ecards designs tell a story, why not choose to send email Christmas cards for business this year and let your customers in for a real treat. You can choose from our large array of pre-texted messages or type your own company message, allowing you to show your full appreciation of your clients support this year.